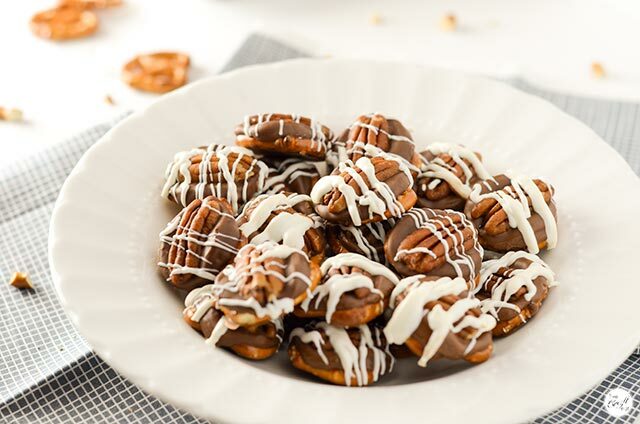 one of my very favorite treats to make whether it’s christmastime (i love to give these out as neighbor gifts) or any other time during the year, are these super simple yet incredibly delicious pretzel turtle bites. my parents used to buy boxes and boxes of turtles every year during the holidays and while it’s nice to have something special that you can enjoy only once a year, i like being able to make these whenever i have a hankering for something sweet and salty. a great perk is that there are only 4 ingredients that you need and they literally take minutes to make. plus, you don’t even really need to prep anything – it’s all just a matter of assembly. for your base (and salty component), you’ll need a big ol’ bag of pretzels. when i was looking for pretzels at the store to make these i found ones called “tiny twists”, as opposed to the regular twisted pretzels. you’ll want to make sure you can find some that are small and don’t have huge gaps in the center. the pretzels should be just slightly bigger than the bottom of a rolo candy (you’ll see what i mean a few photos down in this post). 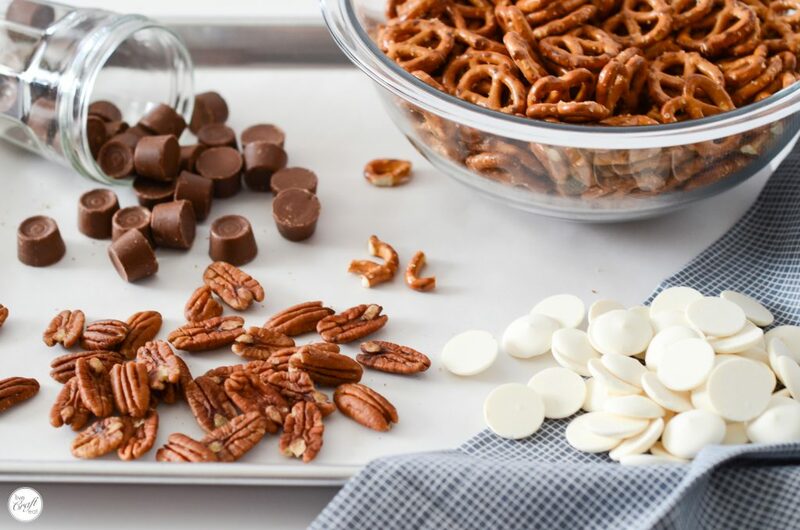 rolos also happen to be our next ingredient – grab a bag or two and try not to eat them all while you’re unwrapping them! 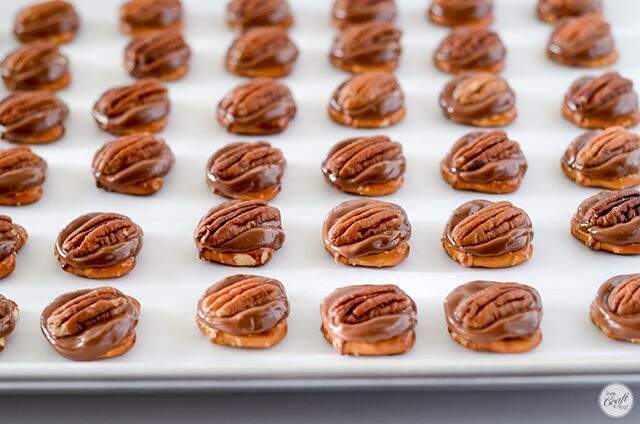 these are the easiest, most perfect way to get the chocolate and caramel that are found in the classic turtles. 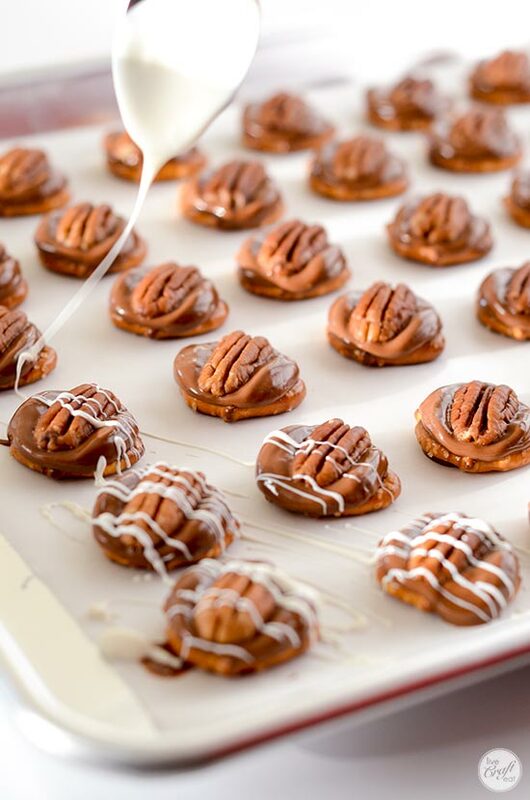 next, pecan halves, because you gotta have them. and lastly, white chocolate wafers for drizzling. now let me show you just how easy this assembly process is. i mean, i really don’t even know if this counts as a “recipe” per se, but here’s how these magical little bites get put together. 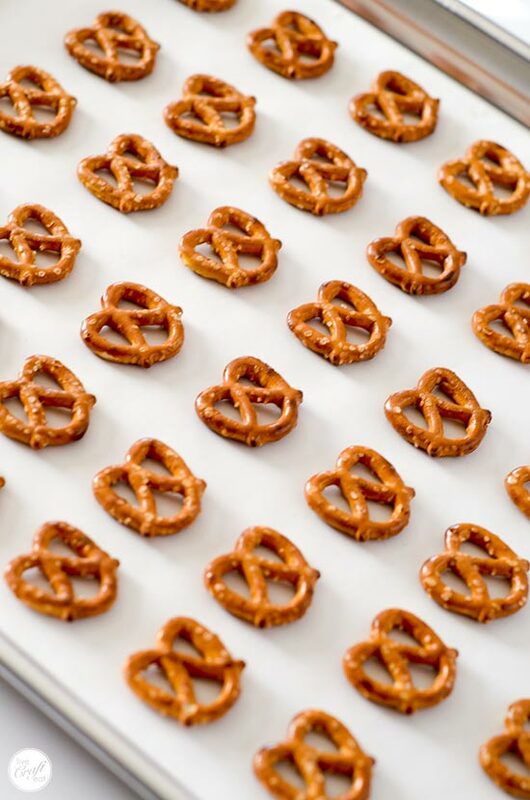 preheat your oven to 350. grab a baking sheet, line it with parchment paper, and line up as many pretzels as you want. top each pretzel with a single rolo candy. place the cookie sheet in the oven for just a minute at a time, until the rolos are just barely soft when you touch them. they should still be holding their shape, but should just gently smoosh down with a little resistance when you push them from the top. (it usually takes me only a couple of minutes in the oven to get them to this point.) turn your oven off now – that’s all you needed it for! you could also do this in the microwave on a microwave-safe plate for 20-30 seconds or so. test out a couple first to make sure you get the right amount of time for your microwave. while they’re soft, grab a pecan half and use it to press down on the rolo candies so they’ve squished out the sides a little bit. the chocolate/caramel will go through the holes of the pretzel slightly, but once they’ve cooled it will all become part of the turtle and will help hold it all together. …or plenty thick – just the way i like it! 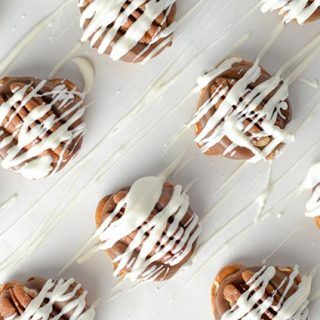 let these cool until the chocolate on both the rolos and the drizzled chocolate have set. 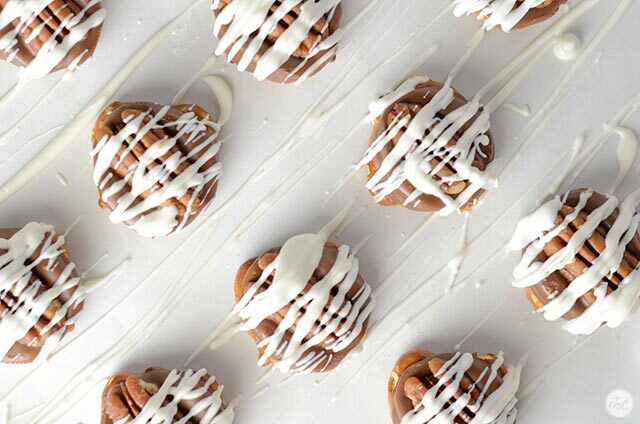 get them off the parchment paper and pop one in your mouth…oh my gosh. i can’t believe these are so easy! they’re seriously addictive. go ahead and have a second one. i won’t tell. putting these out in a bowl on the table means your whole family can enjoy them, but be warned: they won’t last long at all! or your can package them up in a big cellophane bag and tie a pretty ribbon ’round the top and share them with neighbors and friends. or you can hide them on the top shelf of your pantry and don’t tell anyone they’re there…the choice is up to you! however you decide to share them (or not) i think you’ll agree that these are the easiest and tastiest things you’ve ever made. scroll down for the list of ingredients and the assembly instructions, just in case you need them! (because we can’t call this a “recipe”, amiright?!) enjoy, everyone! place pretzel twists on baking sheet in a single layer. 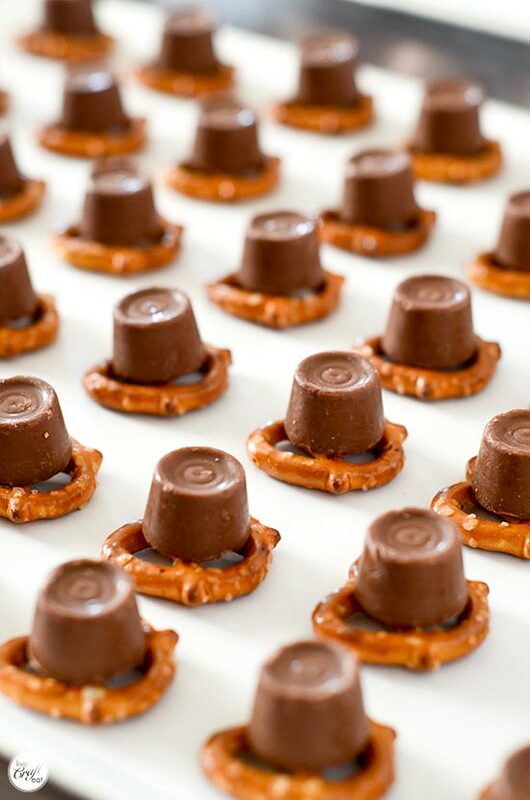 put a single rolo candy on top of each pretzel. 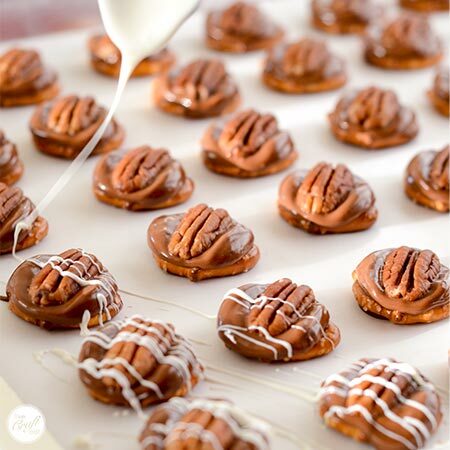 use a pecan half to push down each rolo candy. drizzle with melted white chocolate wafers. These are fabulous! A favourite at Christmas time – but no reason not to make them anytime!